In this video feature we offer a comparison of all of the globally available Nokia Lumia devices running Windows Phone. 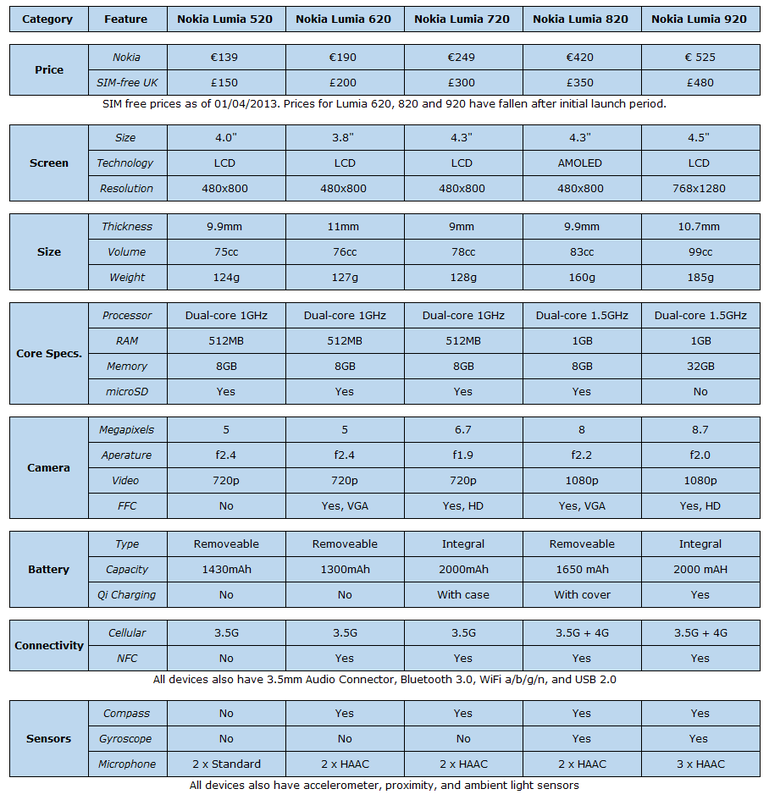 Covering the key pricing and specification differences between the Nokia Lumia 520, 620, 720, 820 and 920, as well as offering personal insights, it helps you answer the "what Lumia device is best for me" question, that becomes inevitable when there's a choice of five devices. So what's the conclusion? Well every device has its own merits... the Nokia Lumia 520 is good for those on a budget; the Nokia Lumia 620 offers the best overall value for money; the Nokia Lumia 720 is the best all round device; the Nokia Lumia 820 is good for those wanting a high spec WP8 device on a budget (e.g. to play all games); and the Nokia Lumia 920, by virtue of its flagship status, remains the top of the heap and the best in class device. If pushed we would probably nominate the Lumia 720 as the best overall device in context, with the caveat the Lumia 920 remains the best device in terms of specifications. However, this really misses the point... by having five device in its Lumia portfolio Nokia is offering consumers a choice, and increasing the number of people who can afford to buy a device. Update: The video incorrectly refers to the Lumia 620 as having an AMOLED screen, in reality it has an LCD screen. The specification grid has been updated to reflected this fact.